Charlevoix, Michigan is taking a rather novel approach to raising money for the reconstruction of a local bridge: selling bits of street history. To help fund the Bridge Lighting Project, organizers are rallying various pieces of town history to sell at an annual apple festival. The highlight of this year’s collection is dozens of 70 year old wooden street signs that have been sitting in storage. Four years ago the city sold of some of the signage, but many still remain – allowing for the opportunity to sell off the rest of them this season. Silver Linings Charlevoix, the nonprofit tackling the bridge lighting project, has raised $130,000 through private donations and community event contributions. They’re only $30,000 shy of their overall goal. According to a Charlevoix Courier article published on November 27, 1940, the signs date back to the same year. The article mentions that plans were underway to construct and then erect the white and black wooden street signs. Each marker was manufactured and lettered in a small Boyne City shop and then installed by municipal workers at a later date. After 70 years of use in the snow, rain, and sun, and then being abandoned to a shed, dismantling the street signs was a laborious task. According to a board member on the Charlevoix Bridge Lighting Project, it took two full days, a number of volunteers, and special equipment to remove the wooden signs from their corroded posts. Just in case you’re interested in more than vintage street signs, the Apple Festival will also feature old, decommissioned parking meters for sale. 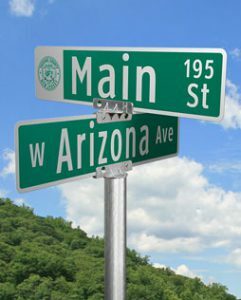 If you can’t make it to Charlevoix for the festival, you can always order custom made Street Signs right here on SafetySign.com. Design and order your own sign in minutes.